If you are a regular reader of my blog, then you may probably hear the name of this device before. Yes, I am talking about Derma rolling System. This device is very easy to use. You can stimulate collagen growth at home with the help of this is a simple procedure. I've been using this Derma rolling System for a month. The derma roller comes in 5 different needle sizes depending on your treatment. Before I have used derma roller needle size 1.5mm. Now I am using derma roller needle size 0.5mm which is an effective treatment for both skin and hair. 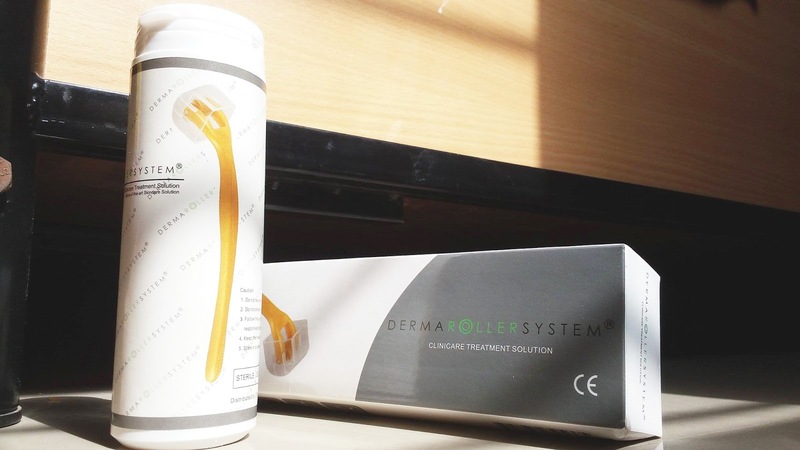 Before moving towards the review, I give you all an idea about this Derma Rolling System. What is the Derma Roller System? 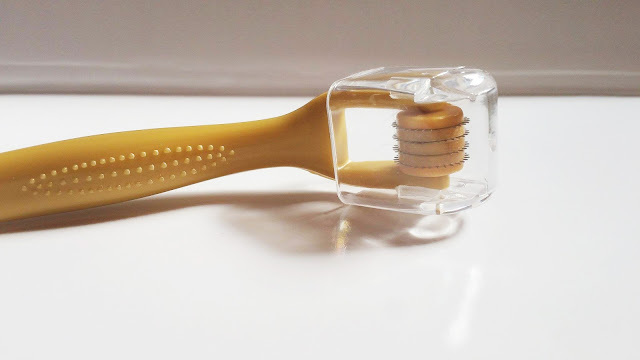 The Derma Roller (also known as a skin roller or micro needle roller) is a revolutionary hand-held device which has the ability to naturally stimulate collagen and elastin in the skin to promote healthier skin cells in the body. Using 200 extremely fine medical-grade needles, the derma roller painlessly creates micro channels in your skin which trigger the body's natural healing process to create new, healthier tissue to replace the imperfections of the older skin. By renewing your skin cells regularly, you will be able to treat common problems we experience as we age such as wrinkles, skin hyperpigmentation, scars (including acne scars), uneven skin, stretch marks (usually developed after pregnancy), hair loss or it can simply be used to create smoother skin. Derma Roller needle size 0.5mm is a multi-purpose device. It reduces wrinkles and it deals with scars. Needle Size 0.5mm works on under-eye circles, it makes these circles less visible. They can help to thicken the skin, smooth facial scars and diminish the appearance of wrinkles and fine lines. Most impotent things this same device can help with hair regrowth. 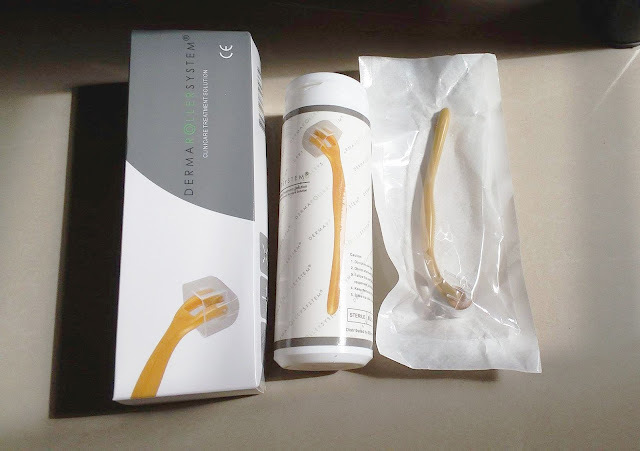 Derma Roller System comes in a cardboard box packaging and all the necessary information is written on it. The Derma Roller is a small hand-held tool that has a roller at the end and the roller is kept in a cylindrical plastic case. There are a collagen Vitamin E mask sheet and a cream along with this roller. There is also a leaflet which contains all the required information related to the method. I have 0.5mm needle size roller. This needles size is mainly used for Cell Regeneration, Upper Derma Reborn, Anti-Aging / Anti-Wrinkle, Light Scar, Pimples, and Blemish, Enhance Nutrient Absorption, Hair Regrowth, and Eye Treatment. Needles are very sharp. Basically the needles come in various lengths, which are designed specifically for different areas of your body parts like face, eyes areas, scalp etc. For the last few years, I have been suffering from the hair fall problem and now it's gradually becoming thin. The needle size 0.5mm, which I am using mainly to treat my thin hair. This device helps for hair regrowth and hair loss prevention. 1.After showering and washing your scalp each day, dry with a clean towel. 2.Roll the Derma Roller gently over the area you wish to treat in one direction only one time (not back and forth). Note: If you notice the scalp flaking after several days, rub the flaking skin away when shampooing your hair. 4.Treat only once per day, up to 5 times per week. After having used the Derma Roller System., I experienced a little irritation or burning sensation for a couple of minutes. But it never hurts me, I roll it on my scalp with a gentle hand. The same device can be used to treat skin several skin problems. If you want to know how to apply this roller on the skin then please check my previous Derma Rolling System review here. To be honest, results depend on the condition you are treating, the needle length used and how extensively you needs to remodel the affected area. I am really impressed with the results. I saw new hair around my forehead. Yes, it helps in hair re-growth. Here I'm sharing with you before and after pictures to help you notice improvements. Overall, Derma Roller System is a tool that could be used for hair treatment and skin treatment. It offers five different needle sizes ranging from .5 mm to 2.5 mm, which are designed specifically for different areas of the skin. I am using the needle Size 0.5 mm for my hair and I noticed the visible difference in my hair growth. The Derma Roller System can help with hair restoration and regrowth by both men and women to treat balding, bald spots, receding hairlines, and thinning hair. The brand claims that who used the Derma Roller System experienced both an increase in hair growth and an average of 80% reduction in hair loss. To some extent, I also agree with this claims. You can also use this roller for your skin treatments like wrinkles, fine lines, and sagging skin. The benefits of this method are multi-fold. I would definitely recommend it to everyone! Disclaimer: The product was sent by PR for consideration. The review is based on my personal experience. 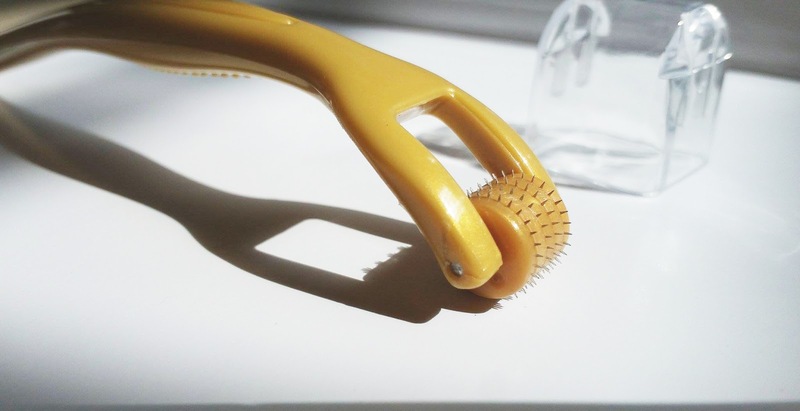 If you are using the dermaroller on your hair you can definitely go for a higher mm which you can use yourself at home. If you are using it on your face it is always best to go to a doctor for values over .5mm. its totally new product. Never seen such a great thing like this. Like your review. I am reading for the first time about derma roller. You have explained so well about this product, how it works, how to use it and so on. Moreover you even demonstrated that it really works. WOW! Nvere heard or read about such a product before. Yes, its a bit too expensive. This is something new I never tried and after seeing before and after result would love to give it a try. I didn't even know about this before. This derma roller seems interesting though. Though using needles on the skin sounds a bit scary, the results are very well visible. Glad to know about this product. My sister would be thrilled to know about this product with those great results! Thanks for sharing!